HTTP is proud to be rated 'Good' by OFSTED in our last inspection. The high regard in which the trainees and training are held by local schools, which helps to ensure trainees’ subsequent high levels of employment." 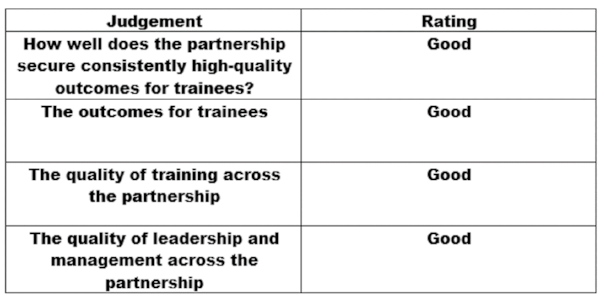 "The high level of individual support, and adaption of the programme in response to individual needs, which ensure that trainees’ progress through the course is good." "Highly effective training in behaviour management which results in trainees who are confident in the classroom." "Trainees have good knowledge of their subject and a good range of strategies to enable pupils to make progress in lessons."